We bought the Red Fox Top Lot at this year's Fur Harvesters Auction in May 2017. We are delighted to receive the "Red Fox Top Lot Award". In the Top Lot are the best 9 red fox skins from over 35.000 red foxes from the entire auction. The Fur Harvesters Auction in Canada belongs to the most famous auction houses worldwide, and they are well-known for their wild fur and farmed skins. 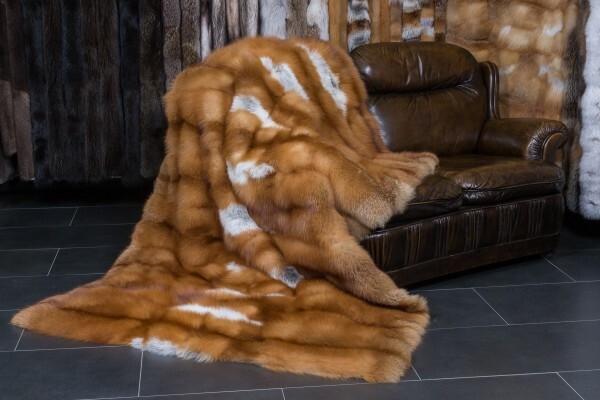 With those beautiful red fox skins, we produced a luxurious fox fur blanket. We used a high-quality, matching black lining and put a soft woolen inlay. Ссылки на другие веб-сайты "Canadian Red Fox Blanket - Top Lot Award 2017"
Оценки покупателей по "Canadian Red Fox Blanket - Top Lot Award 2017"